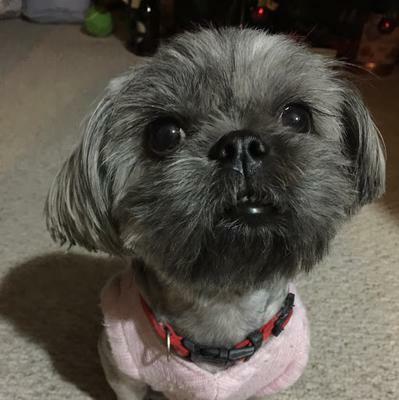 A Shih Tzu dog that went from dark brown, to black, to brown, then gold and finally gray. When we first adopted Muffin, she was this beautiful brown and black mixture. Mostly a dark brown but with a black stripe on her back and muzzle, hence the name. After she got older, about two years later, she started to change colors. She went to basic black. Then she started to become brown after a few months, then gold after another, and then finally she became gray. It's quite strange actually. I don't understand how it happened, but I love her anyways.